A number of prominent state agencies have reaffirmed their continued commitment to help bicyclists and motorists share the road safely with one another. One of those organizations is MassBike, the Massachusetts Bicycle Coalition, offering information and guidelines that may surprise you. MassBike urges travelers throughout the state to visit the”Same Roads. Same Rules.” website for helpful resources about bicycling-related information. The website is also used to help raise awareness about the dangers that bicyclists face. Please consider taking a few minutes to get better educated about how to make traveling safer and help reduce the risks of bicycling accidents in Massachusetts. 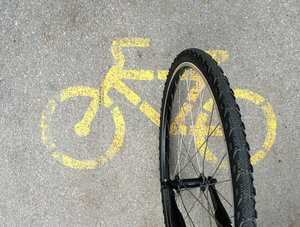 Our Boston bike accident attorneys understand that the solution to all of our problems ultimately lies within us. With safe, cautious and considerate driving habits (both on bikes, on foot and in vehicles) we can all help make our roadways safe and fair for everyone. In addition to rules and regulations, a little common sense can go a long way as well. False. These signs are used most commonly when there isn’t enough space for bikers to have their own lane. This sign means that motorists should be extra cautious of bicycles. The law allows bicyclists to use up an entire lane, meaning that they can ride in the middle of your driving lane if they choose to do so. Bikers will usually accommodate the faster-moving traffic (you) and will get out of the way. They may not be able to do so right away though, so give them a little time and refrain from honking, which can startle a bicyclist. False. New, unskilled bikers typically occupy this lane. Therefore, more experienced bikers tend to ride along the roadway. Motorists should remember though, while a biker can come into roadway lanes, it is illegal to drive or park in the bike lane if you’re in a motorized vehicle. False. Bicycles belong in the street, as they are legally considered vehicles. Bicycles on sidewalks are much more dangerous than bicycles on roadways. In fact, roads were paved for bicyclists, and state law says it’s illegal for an adult bicyclist to ride on a sidewalk. Since both bikes and cars and considered vehicles, they have to all follow the same rules. When riding in the road, bikers are urged to abide by all road signs and signals just as a vehicle would. This goes for right-of-way rules as well. The only variation in the rules each party much follow is where these vehicles can ride. Bicycles aren’t allowed to ride on limited access highways, etc. We urge you to visit the “Same Road. Same Rules.” website. There are some rules and information that may surprise you. It’s important to remember that everyone is required to follow the same road rules and should do so considerately and compassionately. If you or someone you love has been injured in a bicycle accident in Massachusetts, contact Boston Personal Injury Attorney Jeffrey S. Glassman for a free and confidential appointment to discuss your rights. Call 1-877-617-5333.